There’s a rumor that the South College bell tower may be acquiring a bell that rings a high C sharp, but you didn’t hear it from me. Members of Bell and Scroll—the pseudo-secret society that is responsible for the chimes across campus during common hour—informed me that they have wanted one for a long time. When I got to South College last Monday, I had expected someone in a dark hood or maybe with a hunchback to come and meet me, but instead it was an inconspicuous Wesleyan student, who wouldn’t have raised any suspicion if I had passed him on the street. Before introductions, we made eye contact for a few seconds to establish the other’s identity. I would describe to you what he looked like, but I’m afraid I can’t. It’s a secret. It’s 11:59 a.m. when we walk up 19 black spiral steps and into the bell tower. The room is a few yards wide, and through a square window we can see the aerial criss-crosses of brown paths cutting through the white snow on the lawn. In the center of the room stands a wooden manual carillon, which functions like a keyboard with batons that require more force to push down, or like a xylophone with handles. When a baton is pressed, wires that run from the playing console to the belfry move the clappers inside the copper bells. The bell ringer says that the rusting pile of clappers and clapper springs in the corner has been there since he joined the society two years ago. He sits at the bench and, when the clock flicks to noon, begins to play the Westminster Chimes. Another member joins us in the small square room and we talk about their experiences with Bell and Scroll. Both members joined the society during the same semester, both found the club through knowing someone who knew someone else. One remembered walking down College Row when he heard a familiar song ringing across campus. “I thought, ‘I know this song. Somebody I know must know someone in the bell tower,’” he said. He eventually heard someone mention their involvement off-hand and joined soon after. The other member joined by being vocal about wanting to play the bells and finding a connection through a friend on campus. While basic piano knowledge and the ability to read music are encouraged qualifications for new members, the current members emphasized that the most important prerequisite is a passion for the bells. 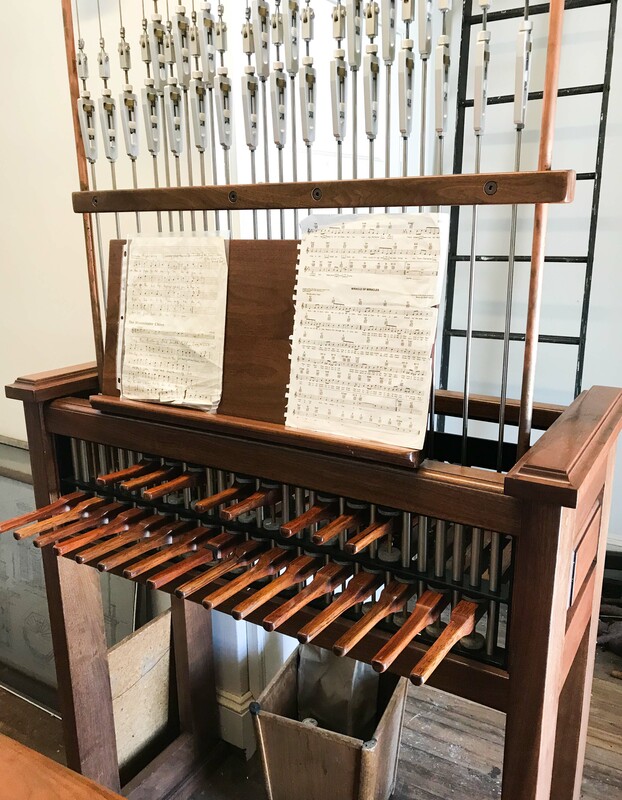 New members spend the first semester apprenticing with a more experienced bell ringer and can play on a smaller, practice carillon that only rings the bells for listeners in the room, not for students walking to class outside. “Usually everyone who comes up knows how to play piano, at least enough to use the bells, but you come first semester and show that you’re not going to just wreck the place,” one member said. The idea for Bell and Scroll came from Professor of German Studies Emeritus Peter Frenzel, who passed away in May 2018. When Frenzel was struggling to find someone to play the bells for the commencement ceremony in 1997, he decided to learn them himself. He published a call for bell ringers in The Argus and was then approached by Holly Schroll ’02, who became the namesake of the guild. In the early 2000s, the society led a fundraising campaign for seven new bells, creating a full carillon of 24 bells. Each bell cost approximately eighteen-thousand dollars, according to a 2017 Argus article. It should be noted that the most secret aspect of Bell and Scroll is membership, but even that can be as private or public as the individual member chooses. (One of the members says, somewhat begrudgingly, “All my friends know.” The other says, “Nobody knows I do this.”) Bell and Scroll meetings are rare and purely managerial, and they take place not in a tomb but on the path in front of South College. The members each play one of their favorite tunes for me and for students on lunch break. The first is “Far From the Home I Love,” a mournful song from Fiddler on the Roof that the member learned from a previous bell ringer. The other plays “Michelle,” a mournful song written by Paul McCartney that was one of the first songs the member learned on the piano. The carillon clacks when the batons are pushed down, and out the window I see a student on College Row look up at the tower. It is six degrees outside, and a member remarks that the bells may be a bit out of tune from the cold. Both of the songs are about love, but played in the minor harmonics of the bells, they sound like the saddest songs in the world. As they enter their last semester with the society, both members reflect on their time ringing the bells, an activity that is public and private at the same time.